Point Judith Light in the Narragansett Bay. sank in the Barents Sea. 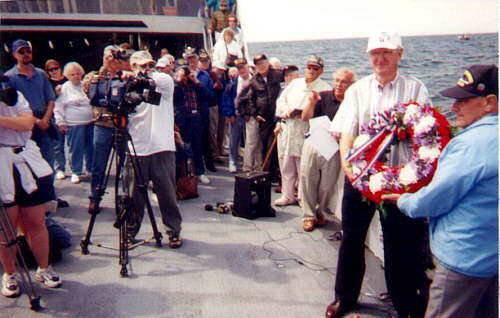 The picture below is of C A Lloyd and the Merchant Marine local Chapter Chairman ready to cast the wreath over the side. quirky breeze and a mischievous public address system. closer to hand and nearer to heart. pair of wrecks below one friendly, one enemy, relics of a long-ago war. sailors aboard U.S. civilian ships in World War II, or belonged to the U.S.
Navy Armed Guard, which provided gunners for defense. 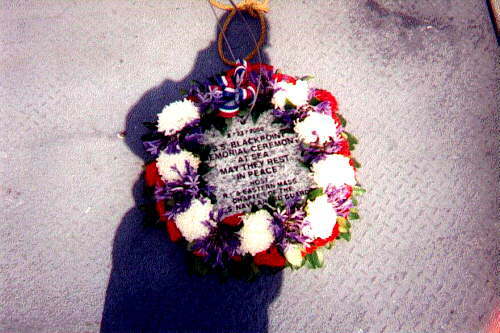 Atlantic, one in which members of both services participated. And died. and one member of the Armed Guard died when a torpedo blew it in half. 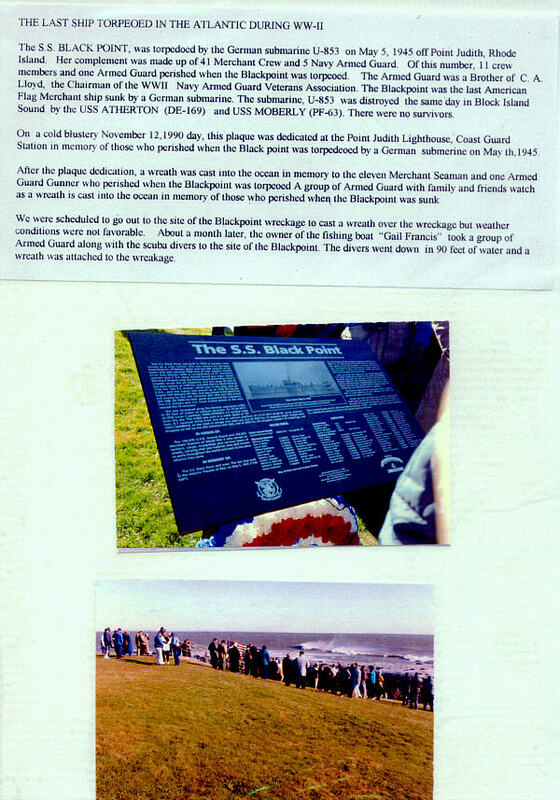 day after the Black Point sank. "This was the only enemy ship sunk in U.S. waters since the War of 1812,"
said veteran Robert Sullivan of Southwick, Mass. 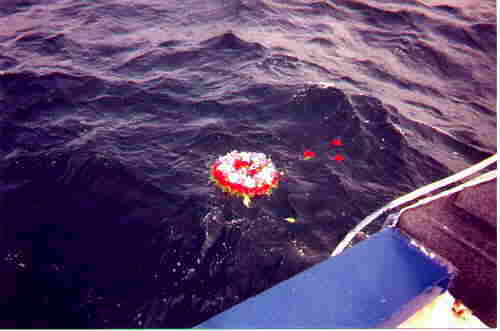 The picture below is the wreath floating in the water. 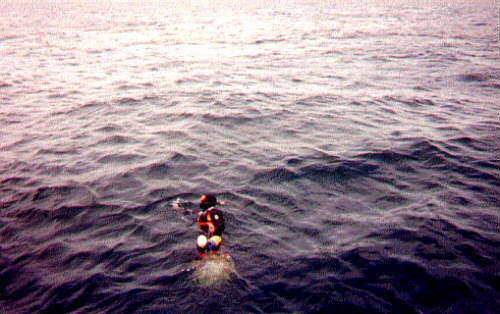 The picture below is diver Bill Campbell swimming away from the Block Island Ferry to prepare to dive and attach the wreath to the SS Blackpoint. and there on the pitching ferryboat. infirmity to tell his story. This was his first memorial service, he said. "You don't remember me, do you?" 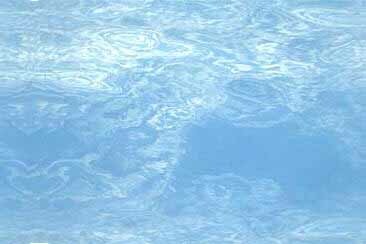 came the cheerful voice of Luke "Rod"
Pelletier, of Orland, Maine, who extended his hand. The two men talked, for the first time in 50 years. they manned, a survivor of the Spanish-American War. its humble cargo of coal. He never did iron those pants. engine room and knocked them both back down. "I ran out to a catwalk aft, and there was no ship left there," he said. "If the damned thing had hit a few minutes later I wouldn't be here. Five minutes that's all it took to make the difference." The blast tossed one of the Armed Guard off the stern. back. Then they tried to launch the lifeboats, and it didn't go well." He indicated a nosedive with his hand: "One of them went straight down." That's why Charles A. Lloyd was there yesterday. Only Lonnie fell in harm's way. commanding officer of the New England chapter of the Armed Guard. Armed Guard and later governor of Rhode Island. created by the slowly rotating propellers of the ferryboat. 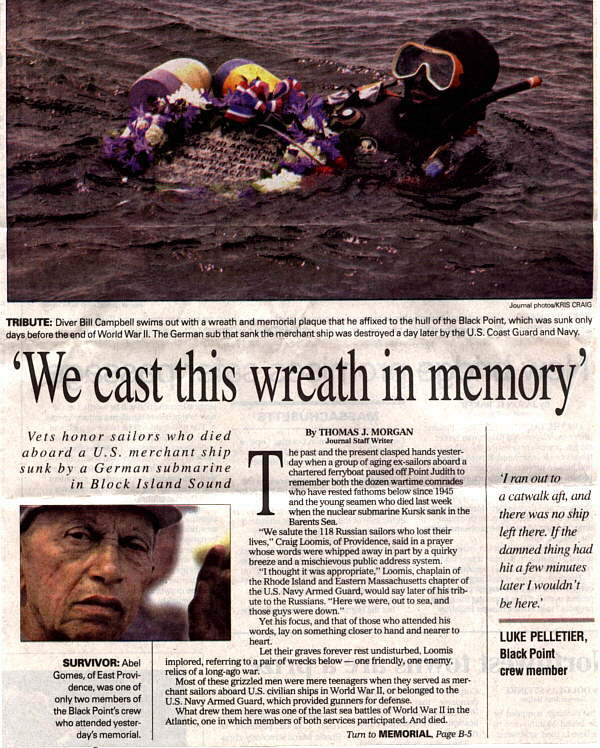 The picture below is the diver attaching the wreath to the SS Blackpoint. 1945, when surrender in Europe was two days away. idling diesels and the cries of gulls. of the Black Points crew who attended yesterdays memorial. 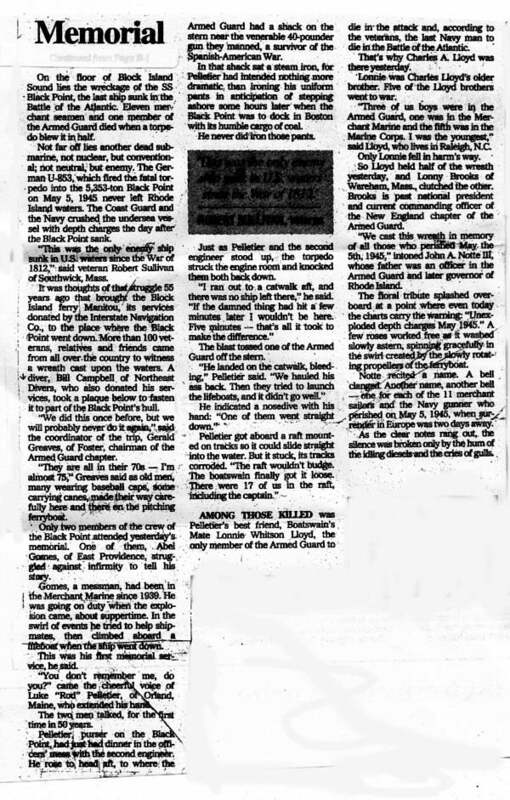 ship was destroyed a day later by the U.S. Coast Guard and Navy.